APRIL SPECIAL! 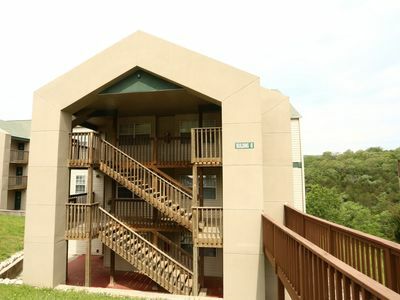 Price lowered to $129 a night! When you reserve our condo, you are not going to be dealing with a property manager, but us, the owners! You will have our phone numbers and email address so you can contact us any time you have a question or concern. 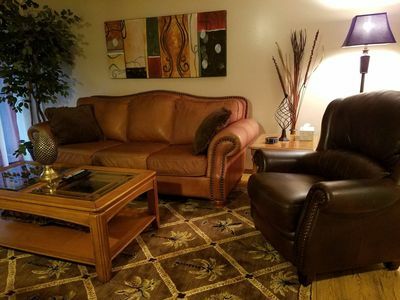 We visit our condo frequently to make sure everything is in great shape and we talk often to our cleaning crew to make sure the condo is ready for you when you arrive. Since we are so familiar with Branson, we can help you make the most of your trip by offering suggestions on things to do and places to eat. 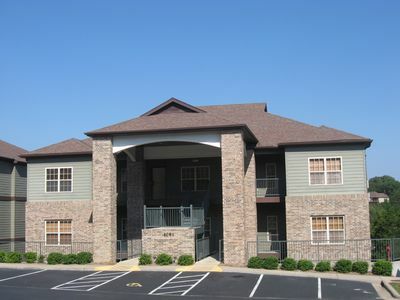 We are ready to be your home away from home while you are visiting the Branson area. Whether you spend your day shopping, enjoying shows, golfing, fishing, or just hanging out with family or friends, the 1500 sq. 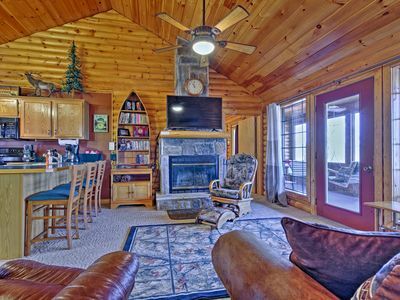 ft. Lazy Lookout is the perfect place to rest and relax after a fun-filled day. 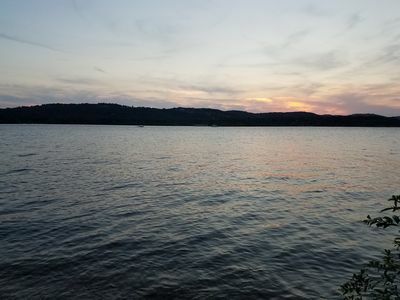 Although we are just a short drive from nearly every Branson attraction, we are located in a very quiet part of town, away from the hustle and bustle of the Strip. The kitchen is spacious and fully furnished with everything you need to prepare home-cooked meals during your stay. We have recently purchased new stainless steel appliances, along with new dishes, pots and pans, and utensils in order to make your cooking experience the best it can be. The kitchen is open to both the living room and dining room, which makes it easy to visit while you cook. There is seating for six at the dining room table and additional seating for three at the bar. The three bedrooms have recently been upgraded with new 10" Memory Foam mattresses, high thread count sheets, and comforters so that you can be assured of a restful night's sleep. 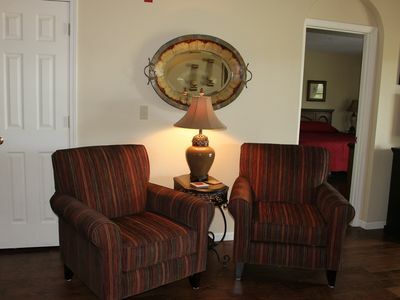 Each bedroom has a flat screen smart television so you can enjoy your favorite cable tv show or Netflix program. 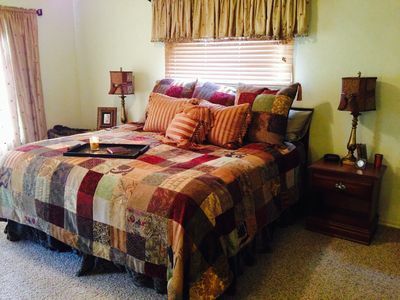 The downstairs bedrooms have king size beds while the upstairs bedroom has a queen bed. If you need am additional bed, there is a queen sleeper sofa in the living room. 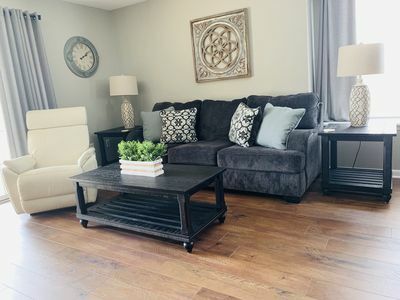 Both the master bedroom and the upstairs bedroom have full private baths, while the other main floor bedroom has a private entrance to the common bathroom. The master bathroom has a double vanity and jetted tub/shower so you can enjoy the hot tub experience from the privacy of your own condo. If you're worried about having to dry off with old, dingy, threadbare towels, WORRY NO MORE! All our towels are new and plush. The bathrooms are stocked with soap, shampoo, blow dryer, and curling iron. 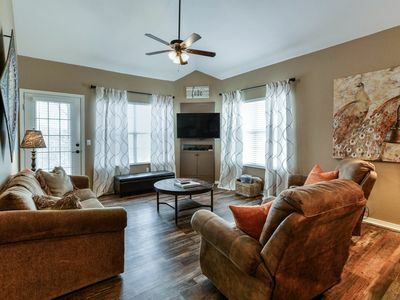 The living room has plenty of seating and floor space for television watching and game playing. We recently purchased a new 50" flat screen smart TV and installed high speed Internet so you can enjoy your favorite cable TV show or access your Netflix subscription. We also have a DVD player in case you want to bring a DVD from home. (We also have a few DVDs for you to choose from.) Some families and friends enjoy playing games at night during their stay in Branson, so you will find an assortment of board games and card games from which to choose. 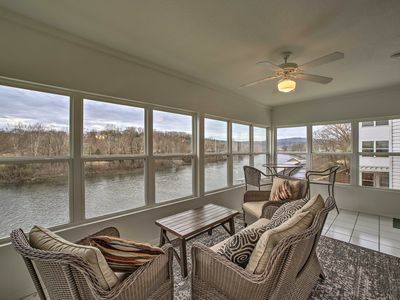 Outside the back door you will find a screened-in porch with a table and chairs so you can enjoy your morning coffee while enjoying the view of the fountain. There is a new front-load Frigidaire washer and dryer in the unit for your use. We also provide the detergent and fabric softener. You will also find an iron and ironing board, high chair, and Pack-N-Play. As a part of the Meadow Brook Community, you have access to two outdoor pools and a hot tub (summer only), as well as a playground and outdoor grilling area. You won't have to worry about picking up or dropping off any keys because we use an electronic keypad with a simple custom 4-digit code. We are right next door to the beautiful Pointe Royale golf community, so golfing is easily accessed. 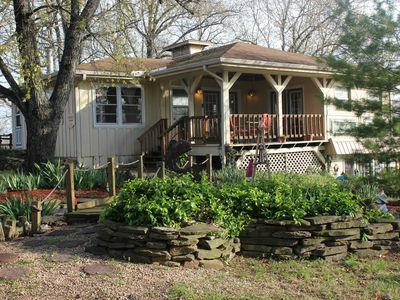 We are only 5 minutes from Table Rock Lake and the Dewey Short Visitor Center. 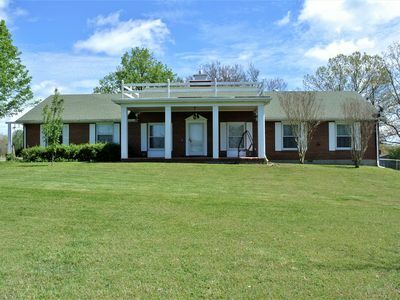 We are just 10 minutes from the Hwy 76 strip for shows, entertainment and dining. We are 20 minutes from Branson Landing where you have access to some of Branson's best shopping and dining on the beautiful Lake Taneycomo. You are about 15 minutes from downtown Branson, which features historical shops, such as the famous Fudge Shoppe and other stores where you can spend many hours browsing the history of Branson. Finally, we are a mere 15 minutes from Silver Dollar City! 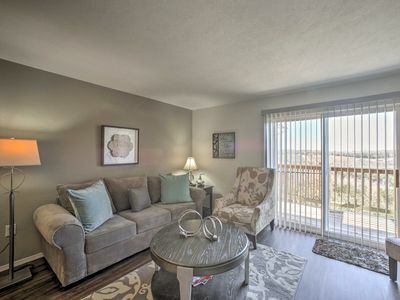 So, if you're traveling with couples, your family, or your grandkids, this condo has access to it all! 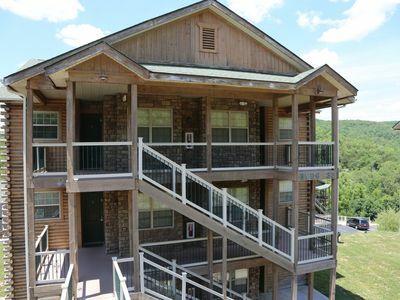 Branson's Best Abode, 1st floor walk out, next to pool. 5-STARS! Close to Silver Dollar City! Gated Resort, 3 Pools, on Golf Course! 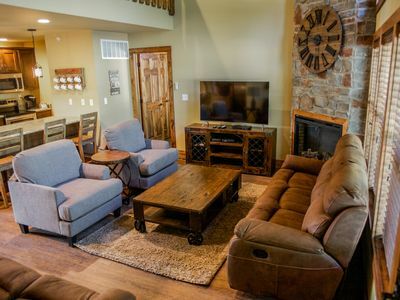 Rustic Branson Cabin-Mins to Silver Dollar City! WOW! 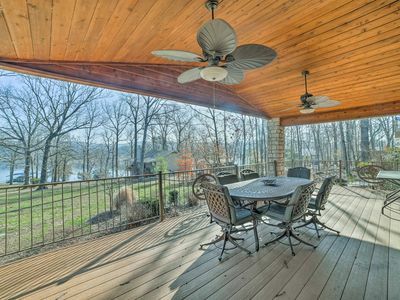 Luxury on the lake by Silver Dollar City! 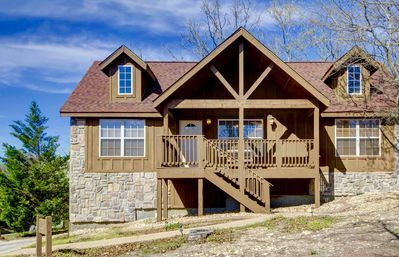 Fabulous Branson Retreat 2br/2ba on Golf Course!! 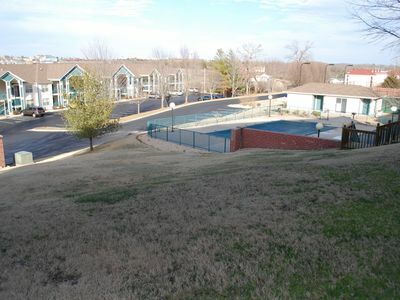 Waterfront Branson Condo w/ Pool & Dock Access! NEW! 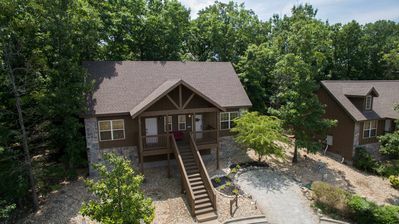 Branson Condo - 5 Mi to Silver Dollar City!